Bottom Up Processing describes the process that our brains use to react to sudden stimuli. When you suddenly hear a doorbell or alarm clock in a commercial and pay attention, that’s bottom up processing. By using the most widely distributed doorbell tone, the advertising company can almost guarantee that it will affect everyone. Bottom up processing is a hold over from the time when we had more primitive brains. When we perceive a threat or a large stimulus input, the primitive part of our brains responds by flooding the brain with neural transmitters and adrenaline. It’s a very crude way of dealing with threats, and it has some implications for us, now that we have more advanced brains. An analogy would be opening a newer document with an old word processor. The information is included, but it comes with a lot of other garbage that has to be sorted through. The effect of flooding the decision making parts of our brains with adrenaline and transmitting chemicals is to amplify every thought. Notions that would normally seem ridiculous get the same credence in our minds as our regular, rational, thoughts. I think that this psychology plays into the phenomenon of Suicide by cop. The perpetrator is in a temporary, heightened mental state where irrational thoughts of suicide begin to take on the guise of normal, rational thought. The conscious part of our minds that makes decisions is overwhelmed by the power of these thoughts. 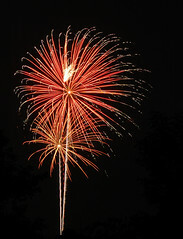 Each thought is powered and amplified to the point where it dominates the conscious mind. In normal thinking, irrational thoughts sometime float to the surface, but are dismissed or used as starting points to come to a rational decision. An auto worker who is laid off may ponder a violent hostage situation, but wind up picketing in front of the plant as a rational alternative. In bottom up processing, the give and take that sorts through irrational thoughts to reach an acceptable conclusion is short circuited, and a normally stable personality may attack police. Fight or Flight is just the most conspicuous example of bottom up processing. We experience it in smaller ways every day. Like the doorbell example, our thoughts, and the weight we give to each one, can be affected by outside stimuli. After a person is in a heightened sense of awareness, injecting a thought and having it remain important in the mind of the viewer is relatively easy. The nature of the stimulus determines which set of culture touchstones you’ll be tapping into. Fed Ex uses bright primary or secondary colors in their logo as the bottom up trigger. Then they inject the thought of movement by creating an arrow between the E and X. It’s a mostly harmless use of bottom up processing to promote a brand. The arrow doesn’t have to be a conscious thing for the viewer, it’s included in the small heightening of senses that the viewer experiences. By triggering bottom up processing, the viewer interprets the whole sign without relying on their normal check and balance system to evaluate what they see. 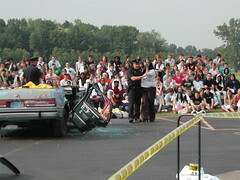 In a high school DWI demonstration, two cars are involved in a mock collision. 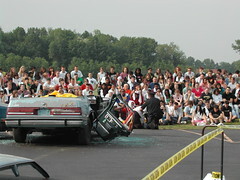 Rescue personnel cut the car apart with the jaws of life and remove the driver, who has died in this demonstration. The mother arrives distraught while the driver is put into a hearse and driven away. The bottom up trigger is cutting apart the cars. 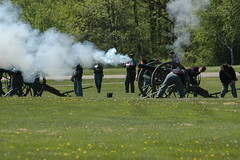 Using the jaws of life is loud and produces a lot of vibrations that the crowd can see, hear, and feel. The crowd is now in a heightened state, and open to suggestion. The commentator, who has been narrating the scene, now uses that to drive home the purpose of the demonstration… drive safe after the prom. By creating a mental state where the crowd doesn’t discriminate between thoughts and gives each one equal weight, the repeated message from the commentator doesn’t compete as much with other thoughts (I’m a safe driver, that wouldn’t happen to me). The “it won’t happen to me” thought has already been excluded by the choice of the bottom up trigger. Telling yourself it won’t happen to you is negated by the chopped up car sitting right in front of you.